We are a husband and wife team, Jean & Peter Butcher, who took over Lakeshore Rentals in 2002. Our mission has always been "#1 in Quality and Service". We're committed to ensuring our property owners' expectations are exceeded and our clients have the very best experience when they rent their vacation property with us. Our vacation renters are like family to us and as testament to our commitment to their vacation experience we have multiple families and couples who come back to us for their vacation accommodation year after year. We're always excited to talk to owners who are considering renting their property, with 16 years experience in the Whitefish property management industry we can provide an insight into the pros and cons of renting and offer comparison figures to help the decision making process. 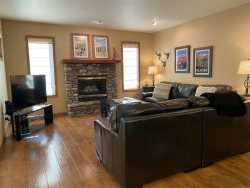 We're always looking for up-market homes near Whitefish, Whitefish Lake, Whitefish Mountain Resort, Flathead Lake and Glacier National Park area. Caretaking for out of state owners primary or second home has also become a large part of our business over the last few years. We can provide references from owners who have used our caretaking services for years. If you are interested in letting us help you to generate income from your vacation or investment home or have a home to be taken care of, or you wish to discuss our services please email us at [email protected] or call us at 406 863 9337.